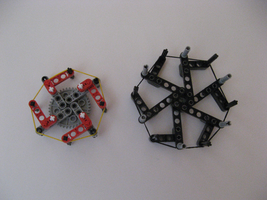 A few years ago I designed a pinwheel escapement in Lego inspired by Galileo's scheme. Galileo was the first person to suggest that a pendulum might be used to regulate a clock: you can read about Galileo's life and work here. Here are some pictures of my original prototypes along with a couple of videos showing the movement in action. The thumbnail pictures on this page expand if you click on them. I've now designed a slightly improved version which uses the same basic geometry but with a reduced and standardised set of parts: here's a CAD drawing of the final version. I've used the well-known MLCad and LPub tools to create a set of build instructions. Click on the Lego parts below to enter the build sequence. I buy most of my Lego from eBay or BrickLink. All of the parts are current production items (in 2009), although the boat weights can be hard to find. 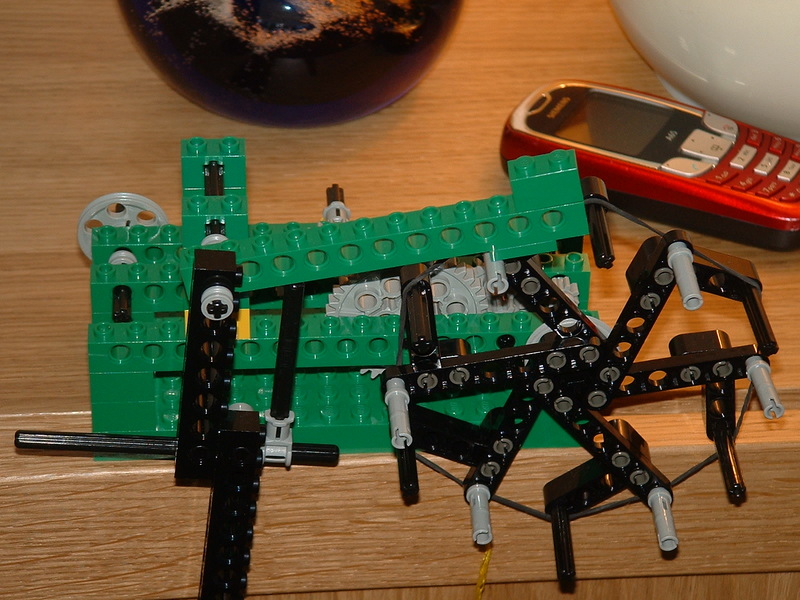 They are the least critical items because any handy weight can be pressed into action: I just like the idea of having a clock made purely from Lego. The first thing to do is to lay out all the parts and compare them to the Bill of Materials page. In particular, the design uses six axles, all different lengths, and it is easy to muddle them up. In the Bill of Materials, each axle is shown with a number above and to the right which represents that axle's length in Lego units. There's no identifying mark on the actual Lego pieces, so sort them by length before you start. Each construction step shows the parts to be used and the axles are similarly labelled so that you can select the correct length. It is important to make sure that you count studs in the drawings and place parts in exactly the right place. For instance in step 10, the grey 1x2 plate should be between the ninth and eleventh hole from the pendulum end of the beam or the escapement timing will be wrong. You only find out you've made an error when you've finished, and things don't actually run. Look at the photographs and videos on this page if in doubt. The weight is attached in step 8. Thread some cotton through the circular bush and tie it on before putting the bush onto the axle. Then tie the other end round one of the weighted bricks. The other weights can then be just clipped on in the normal way. Wind the clock by turning the large gear wheel so that the thread wraps round the axle, not the bush. If you run it round the bush then more thread will be unwound for each revolution, and the clock will run down quickly. Try not to let the thread rub up against the yellow beam as you wind it otherwise the mechanism may bind. The horizontal arm is only just clearing the lowest peg on the escapement wheel, and the vertical arm is between the sixth and seventh hole in the lifting beam, counting from the pendulum end. Make sure that the vertical arm is pushing the base of the pawl (the lifting arm that catches the escapement wheel). If you're unlucky, the axle will just slip between two of the studs on the underside of the lifting arm, and the arm won't move up far enough. If you can't get a regular beat, by far the most likely problem is friction. Make sure that the gears move freely and aren't binding up against the supporting beams. Also make sure that the cotton suspending the weight hasn't tangled and isn't binding up against the support beam. You can also try adding more weight. 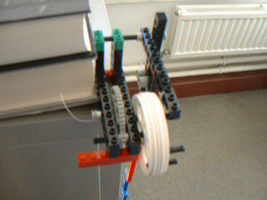 My versions run quite happily with about 150g suspended from the axle (not the bush). With only 100g performance may be unreliable. If you go too far and use a very heavy weight then operation may be too violent and you might miss steps as the wheel accelerates away before the lift arm falls back. Lubrication can help too. Beware of oil-based lubricants as they may melt the plastic Lego gears. I use Servisol SUPER 200 which is a spray-on PTFE (Teflon) lubricant. It works well, and doesn't seem to cause any damage to Lego. A Google search should find you a supplier. Here's a fly-by video of a working escapement to help you iron out any problems. Torque is a force acting at a distance to twist an object. When we turn an axle, we are applying torque. For a given force, we get a higher torque if we apply it further from the axis of rotation. It is easier to turn the escapement wheel by pushing directly on its rim than by twisting its axle because the leverage effect of the larger diameter wheel means that a smaller force is needed to overcome the friction and inertia. On the other hand, that smaller force has to move through a greater distance - we don't get something for nothing. Gears divide torque down. Try unwinding the weight and moving the bush to the escapement wheel axle. You will find that you need much less weight to turn the mechanism, but that the thread unwinds more rapidly. The large gear wheel has 40 teeth, and the small only eight teeth, so there is a 5:1 reduction ratio. You should find, therefore, that you only 20% of the weight but that the mechanism runs down five times faster. We would like the clock to run as long as possible, so we could try adding more gearing stages, and increasing the weight. 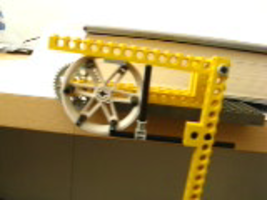 Lego is quite flexible though, so we quite quickly get to the point where the axles bend. 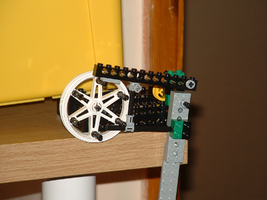 Lego axles and gears also have quite high friction compared to metal gears, so it is hard to build long gear trains that can be turned by a small weight. Friction is not the only thing that makes it hard to turn the mechanism. Even if everything was friction free, the wheel would still take time to get up to speed when it is released. Inertia is the rather mysterious property of matter that make a mass reluctant to change direction or speed. 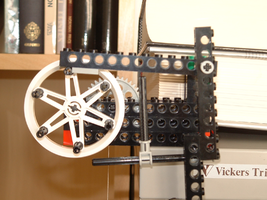 The gear train and the escapement wheel are quite heavy, and so have a lot of inertia. This means that we need to apply quite a large torque to ensure that they move rapidly when the lift arm releases the escapement wheel. 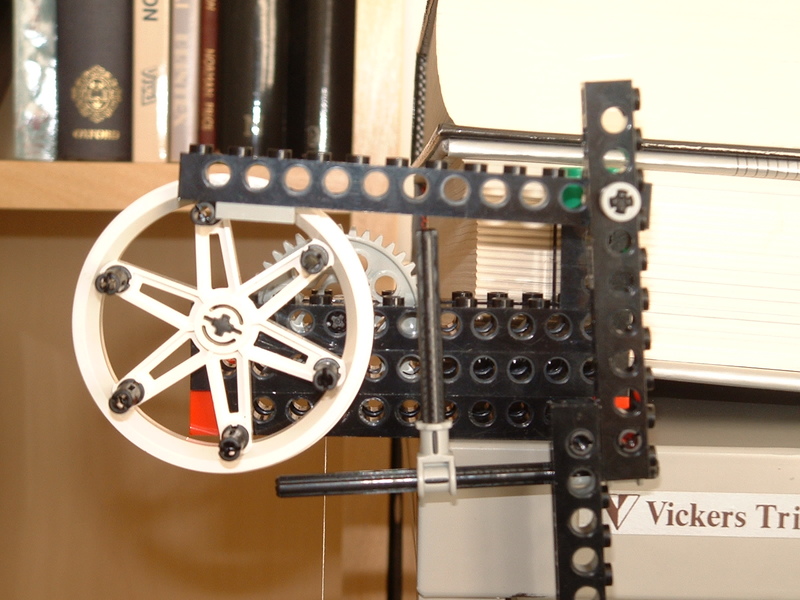 On real clocks, the gear wheels usually have cut outs which reduce their mass and thus inertia. Have a look at the pictures at the bottom of the page on Galileo�s life to see an example. The longer a pendulum is, the longer its period of oscillation. For small swings, the period increases as the square root of the length: so if you want to double the period you need to quadruple the length. The Wikipedia article on pendulums is a good place to start if you want to learn about the mathematics of pendulums. In the next video, I've started two escapements running, one with a four beam pendulum and one with a five beam pendulum. 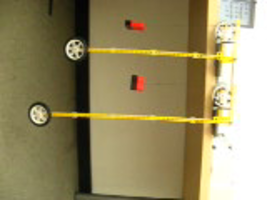 The video is 15s long: the short pendulum performs around 12 oscillations and the long 11 in that time. You might like to try timing them more exactly. It's worth taking care when you try to use the pendulum formula to work out what the period should ideally be: the formula assumes a heavy pendulum bob attached to a light pendulum rod. 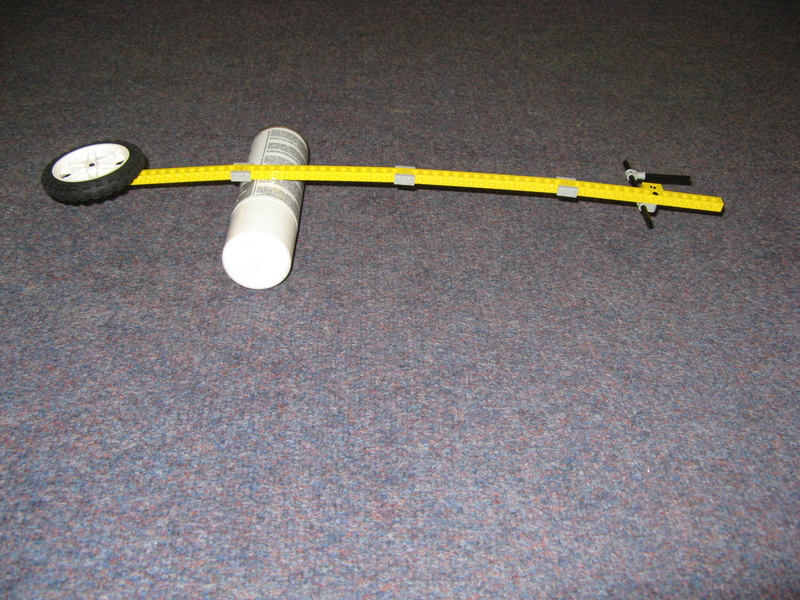 In practice, the centre of gravity of our pendulum is a long way from the centre of the bob, as I have demonstrated in this photograph by balancing the four beam pendulum on a cylinder. Even taking into account the effective length of the pendulum, the escapement still seems to run faster than the pendulum formula predicts. It turns out that this is because the escapement mechanism pushes the pendulum before it has reached the top of its swing, so it starts falling back again earlier than it would if it was swinging freely. 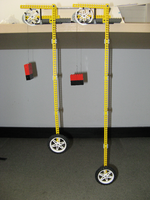 The exact effect is hard to predict and is to some extent affected by the driving force since a heavier weight will accelerate the wheel more rapidly, and it will then push the pendulum earlier in the cycle. 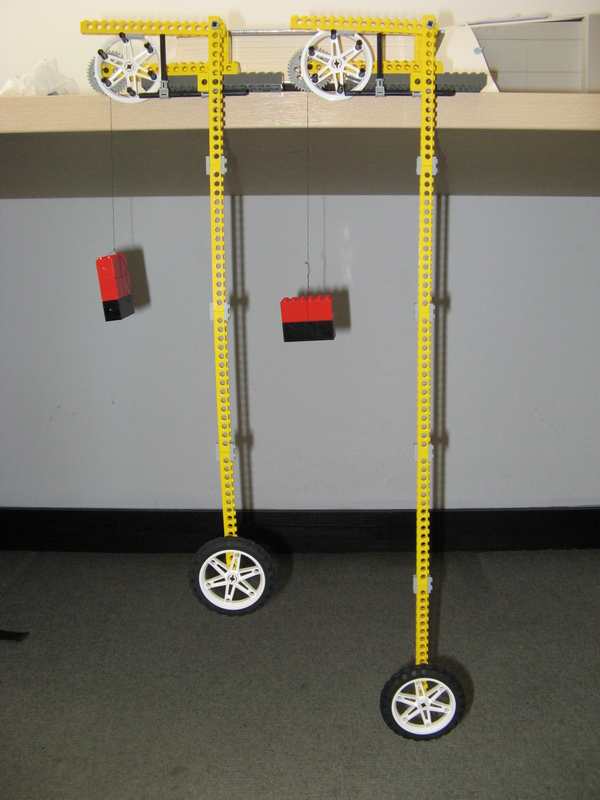 More significantly, changing the length of the horizontal pendulum arm can alter the point in the cycle at which the wheel pushes the pendulum. To demonstrate this effect, here are the same two pendulums swinging but with the lifting pawl moved out of the way so that the pendulums are not being driven by the escapement: they're just swinging freely and will eventually run down. A rough check shows that the short pendulum performs around 11.5 oscillations in 15s and the long one around 10. Clock makers try to make escapement mechanisms which perturb the pendulum swing as little as possible since so as to increase accuracy. The accuracy of a clock based on this escapement would be further compromised because it is temperature dependent: the horizontal pendulum axle will expand in hot weather. In fact, the pendulum rod would also expand, and that would change the pendulum's natural period. Beginning in the early eighteenth century, a variety of designs of temperature compensated pendulums were produced: the basic idea being to make the pendulum rod out of several bars of differnt metals which expanded different amounts in such a way as to keep the centre of gravity of the entire pendulum at a constant distance from the pivot. A 'real' clock is one with minutes and hours pointers, and maybe a seconds hand too. Shortening the pendulum a little would give us an escapement which oscillated at 1Hz, which is a good start. The large gear wheel then rotates once every 30s, and a further 2:1 reduction, perhaps using 16 and 8 tooth gears gives us a true seconds hand. We then need two 60:1 reduction stages to give the minutes and hours indicators. 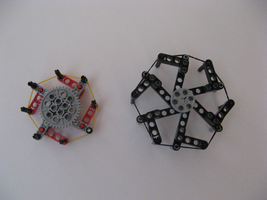 3:1, 2:1 and 5:1 reductions are straightforward with standard Lego gears. However, Lego gears are heavy and high friction, and you would need a very heavy weight to drive all that. At the very least, try and support the axle carrying the weight at both ends. The ultimate goal would be to make a clock with hours, minutes and seconds faces that would run for 24 hours between windings. 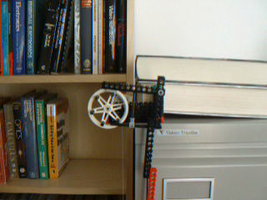 I think this is probably not achievable with standard Lego parts, unless you live at the top of a tower block and are prepared to let the weight descend a long way... or you could try a heavy weight attached to a gear further away from the escapement wheel. If our wheel had more pins, then more pendulum swings would be required to generate a full rotation of the escapement wheel and so reduce the amount of gearing down needed for a full clock. 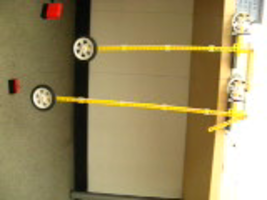 I have tried a few constructions to make wheels with eight and twelve pins. These particular examples are not very stiff, and do not work well. You may have better ideas! Of course, if use an escapement wheel with a different diameter you'll also have to experiment with the height and length of the lift arm. I'd like to hear from you if you build one of these things, and especially if you improve on my design. If you're using this material for science outreach or in class, then please be sure to give me and my institution (Royal Holloway, University of London) a credit. Pages written by Adrian Johnstone, last updated 2 July 2009.